Kingdom Come: Deliverance combat is not easy. There are no magical fireballs to melt the flesh of your enemies, nor enchanted armour to repel incoming stabs and arrows. Instead you must use the tactics of the 15th century to stay alive. A scary proposition, we know. Need help with perks? Try our Kingdom Come: Deliverance builds guide. Open up new possibilities with our Kingdom Come: Deliverance console commands. 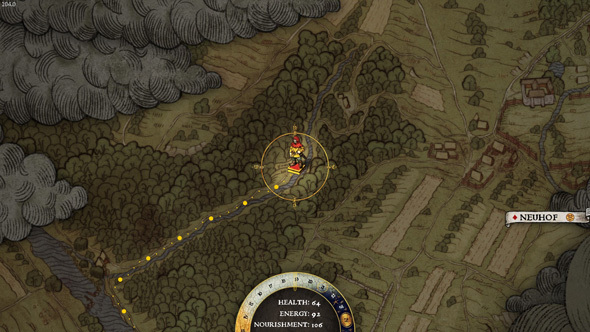 Get rich, save the game, and more with our Kingdom Come: Deliverance survival tips. But fret not, for we are here to deliver you from failure. To help you find your feet during those gruelling early hours of the game, here is our guide to mastering Kingdom Come: Deliverance’s combat. The combat is possibly the single most ambitious system in the game. You won’t have done anything quite like this before. And so, the best way to approach the combat is to adopt the same kind of patience you would for a Dark Souls game, taking the time to read your enemy, being frugal in your attacks. You will learn the basics of combat when you reach the city of Rattay – targeting, chaining attacks, feint attacks – but there are also a few other things you should know. 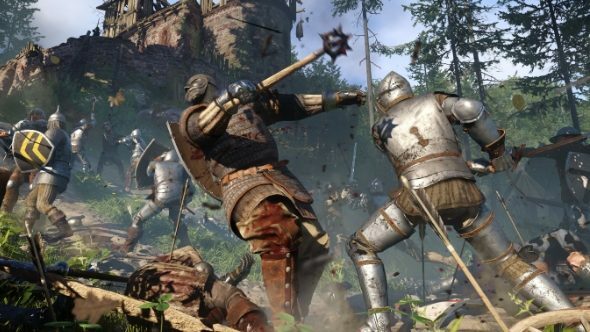 For a game obsessed with the nuances of armed combat, there isn’t actually that much of it in Kingdom Come: Deliverance, which means it is not that easy to get a sustained stretch of practice in. The best way to quickly find encounters is to fast-travel. When you do this, there is a chance of having a random encounter with roadside beggars and bandits, which you can stop for or try to avoid. Whenever bandit encounters crop up you should seize the opportunity to stick a sword in. They tend not to be too tough in the early game, and are a great way to level up Henry’s swordsmanship, as well as practice your own technique. Is your enemy not wearing a helmet? Or maybe he’s opted for the trendy combo of red tights with a plate cuirass? Suss your opponent out and aim for their vulnerable areas, but don’t spam them. 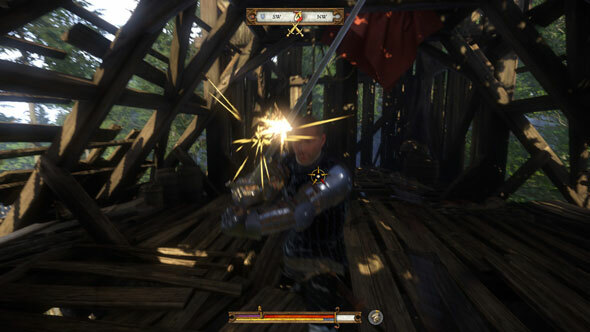 The combat AI in Kingdom Come adapts well to your moves, so mix it up, make your attack patterns harder to figure out, but always try to get at least one hit on the weak spots. As a general rule, blunt weapons are more effective against plate armour, bladed weapons against lighter armour. If someone isn’t wearing great body armour, abuse them with the stab attack. Some defensive enemies are extremely tough to land a clean hit on (like bloody Runt), so when you do it almost comes as a surprise. But vary up your attacks, overpower them in clinches, and you will get there. Once an enemy is staggered, don’t back away, even if low in stamina; take advantage of the opening and get some shots in while they are recovering, then back away to recover. There is no crosshair for archery – unless you use a console command – but you should still line up your target in the centre of your screen (just an inch or so north-west from your arrow tip). Once your bow is fully taut, every second you hold the shot after that will make the aim more wobbly and the shot less accurate. Watch your stamina and get your shots off quickly.